Early Mornings in our back yard. 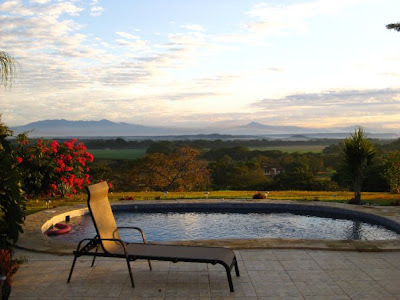 Peaceful does not begin to convey the experience of sitting in the lounge chair watching the sun come up. 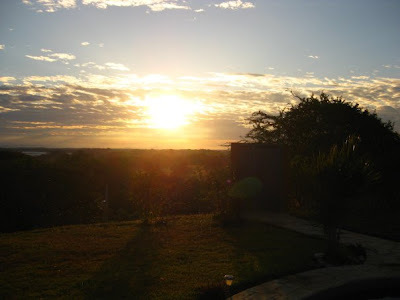 I miss the sun - not in a "I love the heat" kind of way - just in the "waking up to a beautiful day every day" kind of way. Yesterday, Brian brought these flowers to my office for me, because the sun was shining outside and I couldn't see it since I have a windowless office. What a good man. I'll be the first to admit that my short term memory is not always so great. I'm also not so great at remembering the things I should remember: I can often remember what colour shirt Brian was wearing when he told me something important that I can't remember. However, my long term memory, especially as it relates to sound and smell, is often almost good enough to bring me back to the time and place of the memory. Does anyone else have that? Brian thinks that I'm a little crazy. In my first year at Redeemer I took HIS-107, The History of Eastern Europe with Dr. Jim Payton. Fantastic course, by the way, one of my favourites out of the 40-some courses that I took. The man is brilliant, the course material fascinating. The biggest assignment for HIS-107 was to read one of three books and write a paper on the subject. True to form, I worked on the paper from 10pm - 7:30am, camped out at the diningroom table, listening to the same CD all night long. 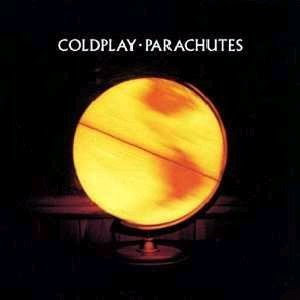 The CD in question: Coldplay Parachutes. Great music! I had been recently introduced to the group by Mr. deSmit, aka "DubD", and was absolutely smitten with the music - especially "Trouble." Every time I hear any song from that album my head immediately takes me back to the Turks and the Serbs, the Ottoman empire and Vlad Drac (inspiration for Count Dracula, by the way). If only my high school math teacher had taught the formulas by way of song, I might have had better luck remembering... anything. I often smell things that might not take me back to time and place but instead put me in a frame of mind and feel things I was feeling way back when. For instance, when I pour our laundry detergent into our washing machine and I smell the appley-spring smell, I can close my eyes and be back at some point in my first year at Redeemer, full of happiness and excitement, but I can't for the life of me remember where or when or why. 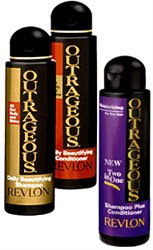 Occasionally a student will sit down in my office and I'll be transported back to the days when both my sister and I lived at home - that's getting to be 11+ years ago now - with the scent of Outrageous hair products. Mmm. I still LOVE that smell. Now, Marya wasn't the only one I knew to use it - Erin in my highschool class and Michelle in my 2nd year dorm also used Outrageous - but it's my days of living at home with my sister that come back to me when I smell it. Photographs capture single moments in time - most of them posed carefully - these are moments we are choosing to file into our memory. The thoughts, feelings, and memories that arise unexpectedly from a sound or a smell - these things that can't be captured with a click of a shutter - these are things that bring a little bit of joy to each day. Labels: Just for Fun, rember when? This bird lived outside our villa in Costa Rica. He made a few different sounds, and I think that this particular one is his mating call. Brian and I think that he sounds a bit like a crackling fire right before he calls out. Here's a taste of what Brian and I did in December... More to come later. This is an inactive volcano around the corner from the Nehemiah Center in Managua, Nicaragua. A restaurant that Dave and Alicia took us to in Managua. Brian got to ride a motorcycle when we were there - it made him very happy. This is a common meeting area in the quad of the Nehemiah Center. What a perfect place to sit and talk! I promise, I will be back soon with some vacation photos. I will just need to either stop getting up at 6am every morning to go to the gym or stop working overtime hours in the evenings and on weekends. I vote for the latter.